The severe drought in California is making not only headlines, but also for some tough, long-term choices. Perhaps this is only a nasty — and lengthy — cyclical drought, and the rains will return, as they have in the past. But that’s not currently evident, and the longer historical record (across millenia) gives little comfort — drought has always been part, in greater or lesser measure, of California’s drama. Accordingly, Governor Jerry Brown has just ordered an overall 25% cut in state water consumption. 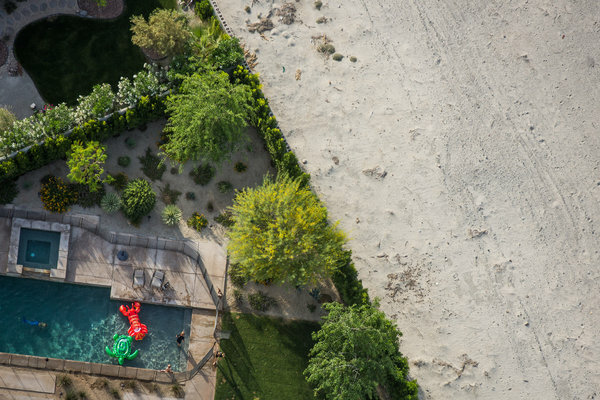 The New York Times’ recent feature, “California Drought Tests History of Endless Growth”, puts this creeping disaster into stark relief, with indelible images of a verdant suburbia bordered by an encroaching desert reality. But if California is really going to get serious about conserving water, it must tackle usage in the agricultural arena, where 80% of the state’s water is consumed. Just a small example cited by the New York Times speaks volumes: more water was used to grow California almonds in 2013 than was consumed by all homes and businesses in San Francisco and Los Angeles combined. There are actually four Green Medals: a Leader Award, given to the vineyard or winery that excels in the “3 E’s” of sustainability—Environmentally sound, socially Equitable and Economically viable; an Environment Award, given to the vineyard or winery that best demonstrates Environmental Stewardship through maximized environmental benefits from implementing sustainable practices; a Community Award, given to the vineyard or winery that is a Good Neighbor & Employer using the most innovative practices that enhance relations with employees, neighbors and/or communities; and a Business Award, given to the vineyard or winery that best demonstrates Smart Business through efficiencies, cost savings and innovation from implementing sustainable practices. (L-r) Cindy DeVries for Fetzer Vineyards, Bob Torres for Trinchero Family Estates, Julie Nord for Nord Vineyards and Mike Benziger for Benziger Family Winery. The Leader Award went to Fetzer Vineyards. Earth-friendly since 1968, Fetzer was the first winery in California to operate on 100% renewable energy in 1999, and the first Zero Waste certified wine company in the world (among many other accolades). Benziger Family Winery took away the Environment Award. All estate properties are Demeter Certified Biodynamic (it was the first biodynamic producer in Sonoma County), and the winery holds annual “Hot Topic” seminars for growers that focus on, inter alia, water conservation, reduction of inputs, biodiversity and soil biology. (The “insect highways” in the Benziger vineyards, which attract beneficial insects, are quite innovative and visually arresting). 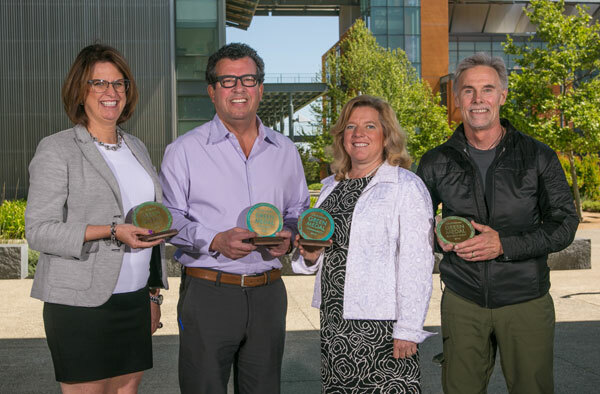 Nord Vineyard Services won the Community Award for its 400 acres of family partnership vineyards at ten locations in Napa Valley, where long-term viability of the vineyards are assured through sustainable business and farming practices. And finally, Trinchero Family Estates garnered the Business Award in recognition of its efficient and innovative sustainability practices that serve as a model for the wine industry, like the use of light-weight bottles and alternative packaging. Four deserving winegrowers who walk the sustainability talk — and then some! This entry was posted in Eco-friendly Products, Environment, Wine and tagged Benziger Family Winery, California Sustainable Winegrowing Alliance, Fetzer Vineyards, Nord Vineyard Services, The California Green Medal, The Wine Institute, Trinchero Family Estates. Bookmark the permalink.